Without a working automatic gate system, no business can work properly. Whether you own a restaurant and your diners can’t get in, or you’re unable to let people out of their apartment building in the morning, problems with your gate need to be solved quickly, by professionals who know what they're doing. Time is money for any business, and you can’t afford to wait. Gate Repair Long Beach is available 7 days a week, and offers same-day emergency appointments. This means you’ll never be stuck without a solution, as all you'll need to do is get in touch with us to have professionals come over and apply a long lasting solution to whatever problem you may have. Delivering lasting solutions to every problem is our focus. Reliability is essential, so Gate Repair Long Beach only uses reliable parts made by the industry's top brands, such as LiftMaster, All-O-Matic and Elite. Gate opener repair services must be carried out quickly, sure, but the solutions need to last so you don't just go back to experiencing the same problem again a short time later. 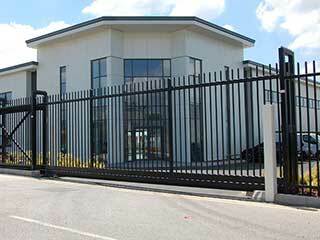 Businesses have widely varying requirements, from major commercial automatic gate systems to smaller swing gates. As a result, there are all sorts of issues that can rise up, from rusty hinges to bent tracks to various scenarios in which the gate gets stuck or refuses to open or close. Whatever the cause, rest assured that you won't have to look far for professional technicians near you. Contact Gate Repair Long Beach as soon as you discover a problem. Whether it's a wireless intercom that requires troubleshooting, an underground opener that stopped working or some welding repairs, you can leave it all to our professional technicians.